President of India addresses the Annual Convocation of the Indian Institute of Science, Bengaluru, Its academic stature as India’s best university has been confirmed by the National Institutional Rankings Framework in both 2016 and 2017. It is also recognized globally, having been ranked amongst the top 200 universities in the QS International Rankings. The President of India, Shri Pranab Mukherjee addressed the annual convocation of the Indian Institute of Science (IISc), Bengaluru today (July 5, 2017). Speaking on the occasion, the President said that it was his privilege to preside over the annual convocation of the Indian Institute of Science, Bengaluru, which is a premier institution for advanced scientific education and research in the country. He congratulated all the graduating students on their success and said that he considers convocation as a landmark day in the life of students, teachers and their parents. It was a culmination of their years of hard work and dedicated efforts. The President said that the Indian Institute of Science, established in the year 1909, was the result of a visionary public-private partnership between Jamsetji Nusserwanji Tata, the Maharaja of Mysore and the Government of India. Over the last 108 years of its fruitful existence, the Institute has laid balanced emphasis on the pursuit of basic knowledge in science and engineering, as well as on the application of its research findings for industrial and social benefit. He stated that it was worth mentioning that Prof. J.C. Ghosh, the Director of IISc in the forties, who is credited with the setting up of several engineering departments in IISc, became the founding Director of the first IIT at Kharagpur. The President said that many alumni and faculty of IISc have played and continue to play a strong role in leading national science and technology institutions and in various advisory or administrative roles in the government. He was happy that IISc has consistently maintained its reputation of being India’s premier institute of higher education and research. Its academic stature as India’s best university has been confirmed by the National Institutional Rankings Framework in both 2016 and 2017. 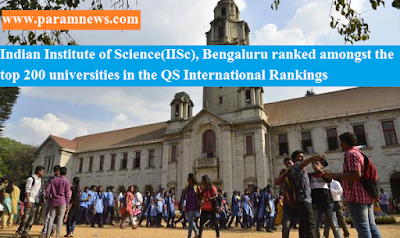 It is also recognized globally, having been ranked amongst the top 200 universities in the QS International Rankings. He said that to his mind, a key ingredient that has contributed to its success is the quality and the number of its faculty members, one that has steadily been increasing in the last few years. He was informed that of the 4,000 students in its campus, over 2,500 are pursuing doctoral degrees. Of its 40 departments and centres, 18 are dedicated to science, 13 to engineering, and the remaining to inter-disciplinary research. The President said that the higher education sector in India has seen massive expansion. The number of universities has increased to 760 and the number of colleges to 38,500. Such expansion has led to better access. However, it has thrown open some challenges like resource constraints and lack of availability of quality teachers. To his mind, an inspired teacher is one who ignites young minds and raises their latent curiosity. The President said that if our institutions have to become world-class, they will have to adopt best practices in their academic management. They will have to move relentlessly in the direction of excellence in whatever they do. The spheres of intervention are many. For one, our institutions have to provide the best of amenities to their academic community. State-of-the-art laboratories will enable quality experiments. Good classrooms including well-stocked libraries will offer students an enriched learning environment. The President said that our centres of higher learning have to develop their social connect. There is need to instill in the students a sensitivity that will inspire them to search for solutions to vexed socio-economic problems. He said that it was important to remember that by 2030 India will have a huge population comprising of youth. This would be an opportunity to capture the world market. However, this demographic dividend could convert into demographic liability if we do not provide necessary skills to our youth. He said that he wanted that bright minds in India should engage themselves in basic research. The onus is on the institutions to produce men and women of substance and character, not merely competent professionals. He expressed hope that the students of IISc who got their degrees today will contribute handsomely to our nation.